Sorry it’s not a very high resolution picture, but the vessel was some way off and I had to zoom on my phone camera to get anything at all. When I was at school I was in the Navy Section of the Combined Cadet Force (CCF) and could identify all types of Royal Navy vessels from their silhouettes. But that was a long time ago and my eyesight isn’t what it was. Neither is the Royal Navy for that matter; the fleet is not only much smaller now but also comprises very different types of ship. Gone are the Type 21 & 22 frigates and the Type 42 destroyers I would have had no problem picking out! Judging by the size I thought it might be a frigate of some sort, but the shape didn’t fit any I could identify. Then the tall mast amidships made me think it was a Type 45 Destroyer, but it looked a bit small. Or had I judged the distance incorrectly? But no, there didn’t seem to be enough superstructure to the aft of the mast so it couldn’t be a Type 45. Turning to Twitter for help, it was quickly identified as a River Class Patrol Vessel. What she was doing there, or indeed which ship it was, remains a mystery. Perhaps someone from the blogosphere can enlighten me? 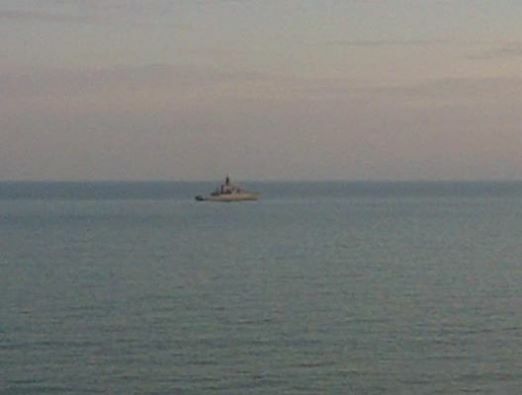 This entry was posted on April 29, 2014 at 9:17 am and is filed under Brighton with tags Brighton, River Class Patrol Vessel, Royal Navy. You can follow any responses to this entry through the RSS 2.0 feed. You can leave a response, or trackback from your own site. A look at the Shiplotter site (www.shipais.com) suggests that it’s HMS Severn, previously recorded on Saturday in Plymouth. Often used for fishing protection. Good work! Presumably to stop people fishing off the beach?